#YYC is gearing up to go cowboy-style for the next 2 weeks, with the annual Calgary Stampede! Get your chuckwagon on, and get thee FREE pancakes! use the Flap Jack Finder HERE! PS~ Guess who'll be leading the Stampede Parade?? The Duke and Duchess of Cambridge- Wills & Kate! I really wish i was going down to the event, but i'll have to watch for it on tv instead. Not quite ready to hit the gong show with my 3 and 5 yrs old in hand. How exciting. I've never been but I'd like to go one day. 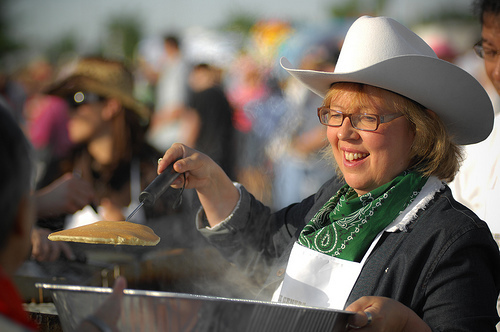 I remember when I worked downtown and we went to a Stampede breakfast everyday! Ya, now with a 3, 4, and 5 year old....I don't think so!